Two prominent thinkers argue for the possibility of a theory of concepts that takes reference to be concepts' sole semantic property.In cognitive science, conceptual content is frequently understood as the "meaning" of a mental representation. This position raises largely empirical questions about what concepts are, what form they take in mental processes, and how they connect to the world they are about. 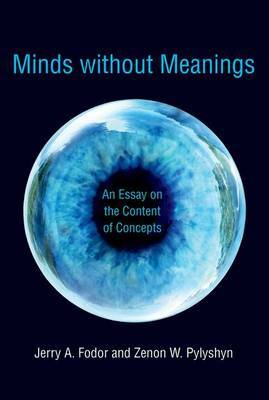 In Minds without Meaning, Jerry Fodor and Zenon Pylyshyn review some of the proposals put forward to answer these questions and find that none of them is remotely defensible.Fodor and Pylyshyn determine that all of these proposals share a commitment to a two-factor theory of conceptual content, which holds that the content of a concept consists of its sense together with its reference. Fodor and Pylyshyn argue instead that there is no conclusive case against the possibility of a theory of concepts that takes reference as their sole semantic property. Such a theory, if correct, would provide for the naturalistic account of content that cognitive science lacks-and badly needs. Fodor and Pylyshyn offer a sketch of how this theory might be developed into an account of perceptual reference that is broadly compatible with empirical findings and with the view that the mental processes effecting perceptual reference are largely preconceptual, modular, and encapsulated.